The way to improve blocking and tackling is to start with a playbook that is written down and shareable. The Why organizations does things is the basics or strategy and alignment of teams to a common vision and measurable outcomes. This is part 2 of 3 in the series: Building Digital Product Masters to Prevail in the Age of Accelerations I describe better, more powerful ways for solving for customer retention and scalable growth by creating common strategies and tactics. In the part 2 of 3 article subtitied Business Enterprise Architecture Right-Sized for your Protection I dive into the framework I call Digital Product Master or DPM . 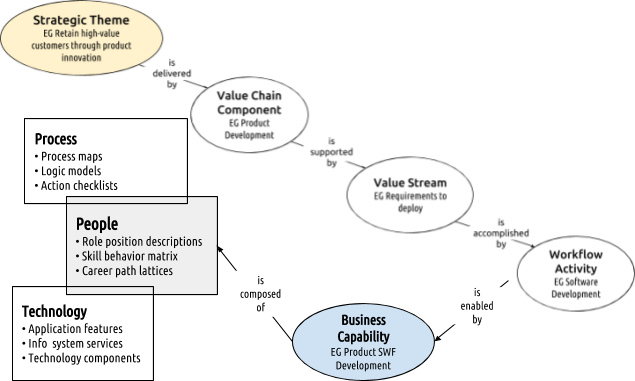 DPM constitutes a simplified lightweight version of established but too-complex-for-our needs Business Architecture and Enterprise Architecture planning activities. Each DPM instantiates a set of templates and teamwork protocols from a model master. This model master balances the fundamental elements of tools, flows and teams for enabling sustainable growth capabilities. The uppermost part of the framework are the strategic elements of intended outcomes. In other words, the why an organization does something. In this model view it is called the Strategic Theme. The middle part of the framework stack are Value ChAins, Value Streams and Workflows, which model the What and organization does. The lower third of the framework are business capabilities made up of combinations or Process, People and Technology that model HOW and organization is capable of WHAT they do in support of WHY they do it. The framework is a reasonably simple combination of even simpler elements. When the DPM model is built out, it becomes complex… but it is not complicated not difficult to understand. The process focuses on delivering value fast for even a sliver of functions in organizations. Starting by understanding and writing down Why provides a North Star for What and How.